The anchor event of our festival, the pageant takes you on a journey through the town of Trinity. The whole summer company will entertain you and enthral you every step of the way. You will meet an array of colourful characters as our past unfolds in story and song. You will long remember Dustabella Durdle’s first winter here, Peter Easton and his band of pirates, the Minister consoling his parishioners at St. Paul’s Church, the raucous mischief of the old travelling court, the heart wrenching stories of hardship and privation, and above all the strength, courage and humour of our people. And you will surely sing the Ode to Newfoundland as you bid farewell to a great and grand recreation of our cherished past. For 26 years, the Trinity Pageant has been hailed by all who see it as a moving and joyous tribute to our beloved New Founde Lande. A feast of mischief, music, and merriment with a meal besides. You will be entertained by many of the magnificent musicians and singers in our company as they sing and play their way through the traditional songs of our culture. Music, recitations, and great comedy are all part of a wonderful evening of food and entertainment. This comedy/drama will have you laughing with glee one moment and shedding a tear the next. Set just after the cod moratorium in 1992, two sisters struggle to come to terms with a community turned upside down. This is a play about family, loss and the courage to move forward. Written by two of Newfoundland’s finest writers, it is a roller coaster of a ride where you will experience the strength of the human spirit, the resilience of our people, and our natural humour. A Tidy Package returns for another season. This story captures all the power, laughter, joy, and stubborn resilience of those who populated the outports of yesteryear, back before they were drove from their homes by the fishing grounds to the so-called growth centres. On All Souls night every year the dead of St. Kevin’s come alive and talk to each other. 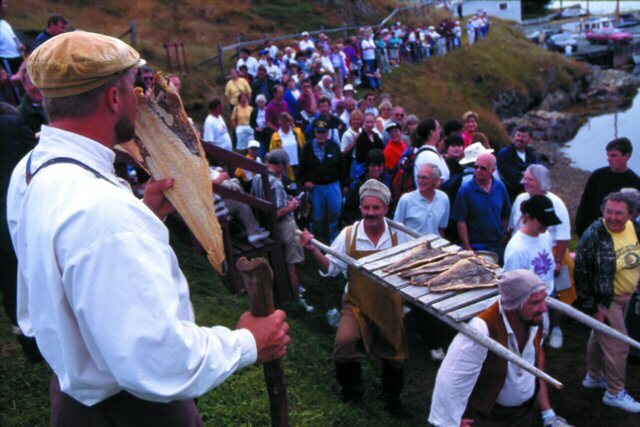 They bring us back to the golden age of the Newfoundland outport. As you watch and listen, you too will yearn for a time before resettlement when these bays and coves were filled with voices of those who lived and worked and laughed and died in the glorious isolation beside the sea. Petrina Bromley has skillfully adapted this magnificent book of photographs and monologues gathered from around outport Newfoundland. Her adaptation blends beautiful, stirring photos with traditional Newfoundland songs and stories that capture an outport way of life disappearing before our eyes. Trinity has the perfect group to present this feast of sights and sounds. Petrina is currently performing in the Broadway hit Come From Away. During the 1940’s, the power of Radio brought the dominion of Newfoundland together like never before, as it began to reach the farthest isolated outports. But what of the people who worked at the radio station? With traditional Newfoundland songs, popular songs from the period, and the much loved and fun-filled Newfoundland Radio show “The Irene B Mellon”, this new musical explores the lives, romances, and power struggles of those working at a radio station in St. John’s, as they square off over control of the airwaves and the future of the country in the years prior to Confederation. In the years after WWI, an unlikely arts hub was forming in outport Newfoundland. Phebe Florence Miller, poet and postmistress, played host to some of the island’s greatest writers, artists, and thinkers; in her Parisian-style literary salon in Topsail, the island’s best and brightest flocked to her beloved writing room, known to its regulars as the Blue Castle. But now, in the midst of the Great Depression, the room has sat vacant for years and its most devoted visitors have seemingly gone their separate ways. That is, until a young poet named Edwin Duder suggests a reunion in this room to make a very important announcement—one that will change Phebe’s life forever and force her to choose between literary aspirations, home, and desires of the heart. The Americans affectionately called her “The Newfie Bullet,” and everyone else called her the greatest ride in the country. In her heyday there was no better way to travel. She offered the best food, fun, service, and down-home hospitality, oh and she got you across the island too. It wasn’t fast, but you didn’t want the ride to end anyway. Daddy What’s a Train takes us on a journey from the first days of the railway to CNR’s take-over after confederation to her last run. Ride the rails with us. A great time will be had by all. Daddy What’s a Train was Rising Tide’s first show 40 years ago, so you will even see some of the familiar faces that started it all.